To The Remnant: History, Hearsay and Heresy, Conclusion: Hastening What Work? I just attended my first day of Education week at BYU on Tuesday and was told by one of the instructors that 60% of returned missionaries leave the Church. He said they estimate that 20% will eventually return but that still means around 50% leave and never come back. My instructor said he was stunned when he was told those numbers by a General Authority. I, on the other hand, was not surprised. How ironic! If you want your child to stay active in the Church, then you shouldn't be sending him or her on a mission. The odds are against you. And I say this from experience. My own son's mission was a disaster. I'd say that statistic is about right. My mission was from '97 to '99 and I'm facebook friends with most of the missionaries I knew at that time. About half of them are no longer active in the Church. This sort of nonsense (the effect you write about, not your post) is what happens when people are given a belief map and then go about actively seeking to create reasons why that belief map must be correct. A better approach, one endorsed by Joseph Smith himself, is to go about seeking truth, and make the inevitable (and painful) adjustments as you go: "“Mormonism is truth; and every man who embraces it feels himself at liberty to embrace every truth: consequently the shackles of superstition, bigotry, ignorance, and priestcraft, fall at once from his neck; and his eyes are opened to see the truth, and truth greatly prevails over priestcraft..."
You are on the high road to Apostasy (intentionally capitalized), my friend. You are looking at Mormonism too closely, and you obviously care, a lot. Those two things will inevitably lead to the ultimate and foregone conclusion the church is simply not what it claims to be. Don't believe me? Keep studying, keep searching and keep caring. It only leads to one place. The church can only survive as long as the members put their heads down, pay no heed to the warning bells around them, and do as they are told. You're obviously not following the required mantra. Hi George, if that is the required mantra for members of the church then it is being inspired by Satan (capital S) and not the Lord (capital L ;)) and his servants. So should we! We all need to consider ourselves fools before God, because we are. These people don't want to be worshiped. If anyone is doing that, we should stop it. A remarkable a timely post. Well done! I'm sharing this far and wide. I'm not surprised...anything you can find to give the church a black eye you publish "far and wide". Anything that is uplifting and (True) is omitted from your blog. Monson will announce any day now that every worthy young woman should be a missionary. It's really quite astonishing how many of these "myths' really exist. I remember a prominent leader stating one time that things we read on the internet is like reading things written on bathroom wall. Unfortunately for the church, it isn't the lies on the "bathroom wall" that deter others from investigating the church, it is the unacknowledged truths that do the most harm. Well said, Adrian. In the face of self-generated hoorah for the Church, its leaders and programs, your increased loyalty to Jesus Christ and the Book of Mormon is striking. There are a handful of folks who believe as you do being shown the door from the claimed big tent of Mormonism. Do you find receptive hearts among your circle of influence? Good strength to you. Your entire thesis is flawed. You assume that policy does not equal revelation. You assume that the age change policy was not revelation. 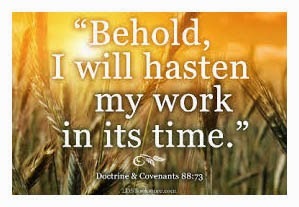 You assume that D&C 88:73 was directed to the missionaries who were called to stay home..........read it again and again until you realize that it says, "I will hasten my work in ITS TIME"-- which means, NOT in 1832 or 1833, whenever that exact verse was revealed. The whole thing was then pinned on President Monson as his idea.........um, maybe it was his idea and he didn't want to say? We don't know. Do we need a "thus saith the Lord" to believe that hastening the work is a good idea, that we are not the hasteners of whom Isaiah speaks? The problem with you, Rock Waterman and other modern day -ites is you find it all too easy to attack and find fault with church leadership, much the same way as the small flocks did in the early ancient church. Guess what happened to them? They destroyed it. The apostles didn't destroy it. The flock did. That's the guide given to us as to how the devil works best. Fortunately, there are those who are AUTHORIZED to lead the church and I believe God sanctions them and seals in heaven what is done on earth, be it through revelation, policy, whatever. It happens quietly. It happens slowly. It happens powerfully. It happens without the signs people like you seek. But by their fruits you shall know them. I like some of what you say. We can always improve. But the bottom line is that me, you, Rock, Denver, et al, have no authority! Thank you for your reply. You obviously care about this a great deal, as we all should. 2. Trust the prophet to tell us what is revelation, as Joseph Smith did continually. If the prophet says it's a policy change, I believe him. And I believe he is perfectly capable of telling the church when a revelation has been received. If we assume everything the prophet says or does is revelation, we not only get ourselves in some severe historical trouble, but we also head down a dangerous road Joseph and Brigham warned us about by not going to the Lord for ourselves. Elder Uchtdorf said the leaders make mistakes. It's OK. We're all mortal and we should allow each other the latitude to err. I'm glad we agree that we as members can improve. That's the point, isn't it? Godspeed, brother. Thanks again for caring enough to comment. Josh, whomever you are, I love your comment. Adrian, I love you and your family. I think working on your tone and your writing style would help. I have been guilty of arrogance in tone and in my heart so I know it when I see it. Confirmational bias is our test for this day. The scriptures can confirm any bias we hold that is not true. We can wrest them and warp them any way we please, but it doesn't mean we are right or that we should share our conclusions. It is up to each of us to ponder our hearts and the path of our feet. Maybe you could say that and leave it at that! Of course you can say anything you like, it is your blog! Haha! Just beware of Pride! I just had a great conversation with your sister in law. She happens to be my VT. Love her! Anyway, she explained a bit more, but I still don't feel good inside about what you are doing. I'll check my own biases and my own heart, but I'm pretty sure what Josh is saying here is correct. Is it truly inspiration from the right source to share these thoughts of yours in such a public manner? The Lord sees so much more than we mortals can see. We are all he has got though so he deals with it! What really is the point for you? Are you saying the whole church went off course after Joseph Smith? What is the point to this article besides the obvious and already stated one over and over by our leaders that we must seek our own light? Keep seeking, but don't let a root of bitterness grow where love and light should be. That always leads to the fruit of rebellion. Go in Peace, Brother! Josh, love your comment. I too am tired of these false prophets that think to "steady the ark" without any mandate or calling from the Lord. They are simply rogues that have gone off on their own, and are interpreting scripture to their own liking. Waterman keeps spouting off D+C 10:67, trying to say that that one, small scripture delivered at the beginning of the book defines what the church is. Thanks for commenting. I think it's worth being a bit careful about assuming we know who has a mandate or calling from the Lord. The Lord calls, empowers, and speaks to whom he will, regardless of church office. Scripture is abundantly clear on this point. The Lord makes it clear who he considers part of his church, and also makes it clear that any other definition is not valid. So yes, one small scripture, from the Lord's mouth, defines his church. If you say otherwise, you are "against" him. It couldn't be more clear. I'm amazed at the lengths to which people will go to claim the Lord didn't say what he said, or didn't mean what he said. I think it's safer to assume he speaks in plain meanings and means what he says, regardless of what we may think about it. So it's as simple as that? The church does not also consist of the priesthood offices, temples and ordinances, buildings, and all the other revelations that were given to Joseph Smith to flesh out that simple scripture? I strongly disagree with you...that scripture is a metaphor just like when Jesus said he would gather us under his wings like a chicken gathers her chicks. If what you are saying is true, then Mormonism is no different than any other mainstream Christian sect, and we do not need the priesthood, or temples. Yes, Friar Tuck. I realize it doesn't match your mental map of the definition of "church." Perhaps you need to toss out your mental map, consider yourself a fool before God, and start as a little child to read and believe what Christ actually said. Christ did not say it is an organization, offices, buildings, manuals, activities, budgets, meetings, dress code, schedule, hierarchy, conference, list of ordinances, temple, or any of the dozens of other things we tend to associate with the word "church." The Lord recognizes as his church the body of people who repent and come unto him. Christ listed two items. Then he said that anyone who declares more than these is against him. Why declare more than these? On a related note, it's very important to understand what the scriptures call "The Doctrine of Christ." 3 Nephi 11 and 2 Nephi 31-32 clearly spell it out. This is another situation where we have declared much more than the Lord has authorized. It is by learning and obeying the doctrine of Christ that we come unto Christ. Everything else is just fluff and distraction. It's possible to spend a lifetime of effort and activity in the long list of church programs and offices, and never repent or come unto Christ. Sadly, this is more common than we care to admit. Hmmm...I get your point here. But, something feels really off to me. Before I read the scriptures each day, I ask for a message from the Lord just for me. He tells me where to go in the scriptures and we have a conversation about it. It's wonderful and I love, love, love the scriptures. I feel that I am growing up unto the Lord. I feel closer to him each day and it makes me want to seek after the good the true and the beautiful in every one and everything. I feel to hasten the work in my own circle and spread the light I have far and wide in loving service to my fellow bros and sisters. As a 42 year old woman, this is what is expected of me. It is a natural process in the maturation of true gospel living. We all have our own time tables for growing up and seeing things as they are and as they really will be. I do not see how criticizing our prophet will help anything or anyone. Your post reeks of arrogance. For my thoughts are not your thoughts and my ways are not your ways saith the Lord. Who the hell are you to know the mind and will of the Lord as given to his chosen prophets? Maybe there is great purpose in the way and manner of their speaking. Maybe and I think this is what you are saying in part, there is a test here for us to get the light on our own. You are walking a treacherous line my friend. Take heed and beware for the devil desireth to have thee that he may sift thee as wheat. God Bless! I'm so glad to hear you are going to the Lord and seeking his word. That's wonderful! And you are exactly right, we all must do all we can in our own circles to promote truth and the cause of Christ. Time is short and it's so important we get our errand from Him, then have the courage to do as he asks. It's not always easy, but then again I don't believe the gospel is supposed to be easy. I'm sorry if I come across as arrogant. That is certainly not my intent, though admittedly I have a great deal to improve in my writing style. I only to seek to do what is asked of me, no matter how difficult it is, or how much criticism it causes me. As you say, there's a test here for each of us to seek the light on our own. Keep seeking the light, Suzanne. I will to. God bless you on your journey. God, creator of everything, does not need a man to speak to you. Religions, and the men who run them, are the blind leading the blind. And we can remember that if 10 million people decide to leave the Church, it's their own responsability, not the Prophet's. You can't evaluate the "prophetic quality" of the President through numbers. According to this, Noah wasn't a good prophet (8 converts only... during 700 years!!). I think we can be confused about the principle of responsability. We can be projecting our own failures on the President. Another thing: God sends angels, special visits, miracles, or voices only when it's necessary. He will not do anythying you can do by yourself. Do you think Abraham or Paul or Peter talked with the Lord once a month, or even once a year?? Do you think they didn't make mistakes in administration policies?? If God sends angels or does miracles or speaks to the people directly only when necessarily, then how do you explain so many instances in The Book of Mormon? Was their life so much different than someone today? What about the scriptures that Adrian quoted in his earliest posts about certain signs shall (not could or might) follow them that believe? Was that only true in a pre information technology world? Have we allowed knowledge to replace faith? If these things are not happening today it is because faith no longer exists. Read this blog from start to finish and see what it is he is referring to. Have you been taught to expect these types of experiences or that they are exceptions to the rule? Maybe it's time to check what causes this unbelief. I'm searching for truth no matter where I find it. However, your article on the surface seems to lead the reader to believe that for some reason those in the COB aren't leading with revelation. I'm not sure about you but I've never prayed over a policy change. "As we have prayerfully pondered the age at which young men may begin their missionary service, we have also given consideration to the age at which a young woman might serve." Sounds like revelation or inspiration to me. What I hate about these types of blogs is that there's always a personal axe to grind. Never subjection used on the posts. You have the TBM never acknowledging that there are errors in our history or doctrinal teaching today. Then you have the wolves in sheep clothing trying to pose as a member of the flock only to lead them into "forbidden paths" (1 Ne. 8:28). I've yet to come across anyone that is willing to call it both. Does it have to be an either or? I'm not saying that it's a bit odd that the the theme of Hastening the Work is being tied to President Monson when he never once mentioned the term or scripture in his remarks on that subject. If a certain piece of information doesn't support your argument, leave it out. I'd rather have you omit something than intentionally try to mislead by bending the facts. Thank you for this comment. It's a perfect illustration of what I'm talking about. President Monson said he prayerfully pondered. He did not say he received a revelation in answer to that prayer. I prayerfully ponder many things, and I'm sure you do to. Sometimes I receive answers about those things, and sometimes the Lord leaves me to study, search, and ponder more. But I know when I get an answer. I can tell anyone who asks which decisions I've made myself, and which I have made in obedience to personal revelation. Saying "I prayed about it" is not the same thing as saying "the Lord has directed me to do this." If President Monson received revelation about the age change, he certainly didn't say so. He said he prayed. And yet, you're taking the position that this means he received revelation. In other words, you're putting words in his mouth that he didn't say. And this is exactly what I mean in this post. Please understand, I'm not being critical of you at all; so no need to take offense. I'm merely pointing out what is part of our groupthink. It's something we all do without realizing it. We WANT our leaders to receive revelation, so we take any opportunity we can to say they are. It's not helped by the ambiguous or misleading statements that are made for us to run with. Rather than saying we've "prayerfully pondered" this decision, isn't it just as easy to say, "I've asked and the Lord has revealed to me that it's his will for young men to be eligible to serve at 18 and sisters at 19." --NOW it’s a revelation. Just as easy to say, but a VERY different statement. Perhaps in another post I'll give some examples of this sort of ambiguous statement that is commonly made by church leaders who won't come right out and say what they mean, but will make statements designed to lead us to believe they have said something they have not. God is direct about revelation. Joseph Smith was direct about revelation. Why should it be ambiguous, and why should WE say the prophet has received a revelation when HE isn't willing to say so? He IS the prophet, after all. It's well within his rights to receive revelation for the church. Why not say so? Why hide it? Should revelation to the church be secret? I believe it is very risky for us to start claiming things in the name of the prophet that he doesn’t claim. I think the post is excellent, truthful, written with clarity, non-judgmental and direct. I see no pride or ill- will behind it. It is a message I wish I had written. Well done. I agree with it completely. So do I. The post was well written and true. "And yet, in the April, 2014 General Conference, no fewer than FIVE general authorities spoke on the "hastening," nearly always tying it in some way to President Monson. They put the words he never said, squarely in his mouth." Not seeing these "hastening" words being tied to Pres. Monson at all from April 2014 conference, much less being put "squarely in his mouth." Can you provide the 5 references/examples? Presumably at least 4 of the 5 examples will do this unless I misunderstand what you mean by "nearly all." In my quick search of the April 2014 conference, I found only 5 total talks that even mentioned "hasten" in one form or another. Four by "general authorities" and one by Sister Burton (Pres. of Relief Society), who may not be considered a "general authority" by all of your readers. This seems to be a far cry from "no fewer than FIVE" as you claim. You even YELLED it! Don't have time to check all you claim in this blog, but it's a bit disheartening to have the first thing I briefly check come out differently than you claim. Hope you can tell me what I missed. I've read your whole blog and find it quite interesting. I'll find it much less interesting if there are misstatements. Thank you so much for taking the time to check my references and to comment. I’m humbled and inspired that you find this important topic worthwhile, as I do. "Together, as sisters and in unity with living prophets, seers, and revelators with restored priesthood keys, we can walk as one, as disciples, as servants with willing hearts and hands to hasten the work of salvation." You are correct. She is not a general authority. She is a general officer. Perhaps this distinction is worth noting, but only if we’re willing to discount her words, given over the pulpit at General Conference, as somehow less important than her male counterparts. I don’t believe you or I would do such a thing. By tying this hastening to living prophets, seers, revelators, and keys, I hold that is most certainly a reference to President Monson, who holds all the keys. "What a great time to be alive. This is the last dispensation, and we can feel the hastening of the work of salvation in every area where a saving ordinance is involved." "When then-Elder Monson delivered those dedicatory remarks on June 20, 1964, there were only 12 operating temples. During the period President Monson has served in the senior councils of the Church, 130 of our 142 operating temples have had their initial dedication. It is nothing short of miraculous to see the hastening of the work of salvation in our day." "In the 19 years since this prophetic statement, the acceleration of technology is almost unbelievable." "The leadership of the Church has issued a clarion call to the rising generation to lead the way in the use of technology to experience the spirit of Elijah, to search out their ancestors, and to perform temple ordinances for them. (26) Much of the heavy lifting in hastening the work of salvation for both the living and the dead will be done by you young people." 26. See First Presidency letter, Oct. 8, 2012; see also David A. Bednar, “The Hearts of the Children Shall Turn,” Ensign or Liahona, Nov. 2011, 24–27; R. Scott Lloyd, “‘Find Our Cousins’: Apostle [Neil L. Andersen] Counsels LDS Youth at RootsTech Conference,” Church News, Feb. 16, 2014, 8–9. "For those who are looking for more fruitful use of the Sabbath day for the family as a whole, the hastening of this work is fertile ground." As you can see, Elder Cook makes a number of references to hastening the work. In paragraph 2, he uses President Monson’s name. In paragraph 5, he ties it to the “Leadership of the Church," in the form of a letter from the First Presidency, referenced in footnote 26. "The divine purpose of technology is to hasten the work of salvation. As members of the choice generation, you understand technology. Use it to accelerate your progress toward perfection. Because you have been given much, you too must give (see “Because I Have Been Given Much,” Hymns, no. 219). The Lord expects you to use these great tools to take His work to the next level, to share the gospel in ways that are beyond my generation’s wildest imagination." Elder Ridd ties it directly to the Lord. Granted, this is not a direct reference to President Monson, unless we were to stretch it to say if it came from the Lord to the church, it came through President Monson. Most members would make this connection. Some would not. "I know of a branch president who almost every day brings people to the missionaries for them to teach. Just a few months ago he was not yet a member of the Church. Now there are missionaries teaching and a branch growing in numbers and strength because of him. But more than that, he is a light to others who will open their mouths and so hasten the Lord’s gathering of the children of Heavenly Father." Elder Eyring does not tie the hastening to President Monson, but he is a member of, and speaks for, the First Presidency. "It is my testimony that as we work together, seeking the one, inviting, and following up with trust and faith, the Lord will smile upon us and hundreds of thousands of God’s children will find purpose and peace in The Church of Jesus Christ of Latter-day Saints. May the Lord bless all of us in our efforts to hasten the work of salvation, I humbly pray in the name of Jesus Christ, amen." Elder Ballard calls President Monson by name, and quotes him, tying his quote to hastening the work. 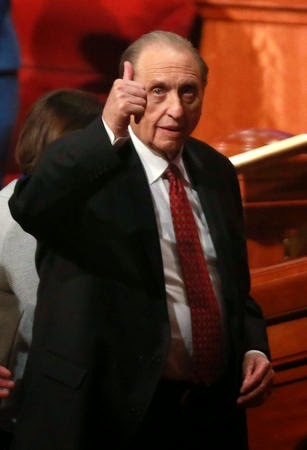 b) whether that theme is tied to President Monson. The connection looks pretty strong to me. However, I think you also make a good point, that I may be over-emphasizing the connection. Therefore I will edit the text of the blog post to be more clear. I agree with you that it’s important to state it correctly and clearly. Thanks for bringing this up, and for reading my poor scratchings. Thanks for taking the time to respond. Looks like you and I found the same talks. It is just a policy change, and can therefore be changed again if needs be, without contradicting a revelation. Wow! If the previous comment isn't the philosophies of men mingled with scripture, then I don't know what is! You take a reinterpreted version of the Bible and throw in your own interpretation of each verse? Adrian, you said we need to take D&C 43 in context, and yet you post a comment that is from a book that was clearly written about Jerusalem, without correction? I understand that we cannot rely on the arm of flesh. I understand that we call things revelation that are not revelation. I understand that prophets are men, and therefore fallible. But the above comment seems blasphemous to me. Are you saying that false prophets are leading the Church? Because if you are, just come right out and say it, please. I meant Section 112, not 43, sorry. I don't edit comments. There are certainly many varying viewpoints, and comments posted here with which I disagree, but there have only been two that were so patently offensive that I declined to post them (both were attacks on Joseph Smith). I try to allow all viewpoints as much as possible because we can all learn from various viewpoints, even those with which we disagree. I found the comment to be worthwhile, particularly in the idea that we have, indeed, whitewashed certain parts of our history. I took the thrust of the comment to be that the Lord will tear down falsehoods, rather than to be an attack on church leaders. I do not believe that false prophets are leading the church. Keep in mind, the point of my original post is that we, as members, tend to act the role of false prophets ourselves by putting words in our prophets' mouths. Thank you for the clarification. I wouldn't expect you to edit comments. By correction I meant a follow up comment. I'm 'late to the game' here, but I found this post excellent. Like many others, I've heard the "hastening the work" mantra over and over, but I didn't know the original source. I find it to be just another slogan like SWK's "Do It!" was in the 70's. Thanks again for your great analysis. When this "announcement" came out while I was on my mission, it was received very well among the forces already out. It was exciting to hear about younger people coming (although I was quite envious of their position to get their missions over with at an earlier age than myself). But we as a mission were beyond excited. This meant more baptisms, more work, more young, energy filled people to do with whom we could now do more work. Shortly after this announcement and the tying of the "hastening of the work" to the world-wide broadcast in June 2013- we experience a "drought". Now being home I have returned to my mission area, and have spoken with my mission president. The numbers remain the same. Anyway, I thought I would share a personal experience with this announcement, and to let you know firsthand, that before this announcement was made, we experienced tremendous success in that mission. Then that announcement came and the "stats" dropped significantly. Thanks for bringing this up. I love all of this. I hope you do not share the fate of other bloggers, like Rock Waterman. His incessant complaining about the church has caused every nut-job anti Mormon around to gravitate to his comment section. He also recommends books by people that he, himself, has not read, and that contain outrageous and weird doctrines. You seem like a decent, and humble fellow. Good Luck. I just got out of a stake leadership training meeting taught by a member of the Seventy. He described deliberations among the First Presidency and the Quorum of the Twelve on how best to hasten the work and address religious drift in the church. Their solution? To re-emphasize the holiness of the sabbath so we'll be more inclined to hear the direction of the Holy Ghost. A great idea! Whatever you call it, if it hastens our willingness to repent and draw closer to Jesus Christ it's a good step forward. For those still in the church, expect to hear a lot about honoring the sabbath in the coming months.